There are so many different kind of aquarium filters out there, you might be wondering which is the best kind for you. Well, you can stop wondering because we did our research and looked at some of the newest and best-selling filters to help you choose. Before we get into our aquarium filter review, let’s take a quick look at some of the features you need to consider when choosing the best aquarium filter for you. 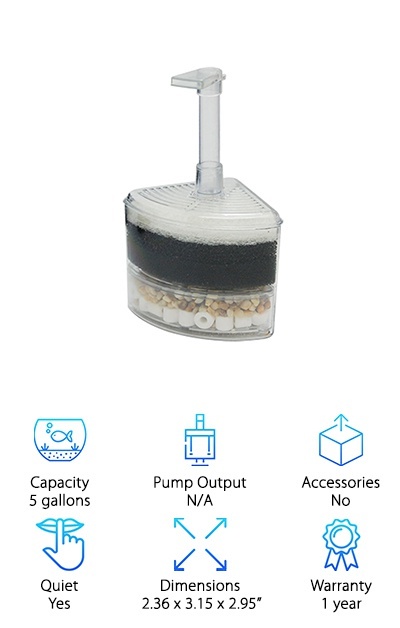 Capacity - The size of your tank determines how powerful a filter you’ll need. Obviously, a 100-gallon tank will need something a little more substantial than a 5-gallon tank. Getting the right size is key to getting clear water. Pump Output - For filters with a pump, this is the measure of how fast it filters the water. It should be roughly 3 times the tank capacity. Some filters don’t use these kind of pumps, though, and you’ll need a separate air filter instead. Accessories - No, we aren’t talking about decorations. We consider filter media to be the only accessories your filter needs. It’s a nice bonus if everything you need to get started - mechanical, chemical, and biological filter media - is included with your pump. Quiet - None of these filters are loud. Sure, some are louder than others, but they’re all relatively quiet. For filters that require an air pump, keep in mind that you’ll need to consider the noise it makes, too. Dimensions - Filters come in all shapes and sizes. Wide, short, narrow, tall. That’s good because you know what else comes in all shapes and sizes? Aquariums. Find one that suits the shape of the one you have. Warranty - Warranties are always important. Make sure you know what’s covered and what isn’t. Some filters have more moving parts than others and are therefore more likely to break. A good warranty can help offset that. Having a clean tank is the most important part of creating a nice home for your fish friends. The only way to do that is to make sure you have the right filter. Now that you know the important features to look for when buying an aquarium filter, let’s take a dip into our reviews. If you don’t have a lot of time, make sure to take a look at our top and budget picks first. Alright, let’s dive right in! 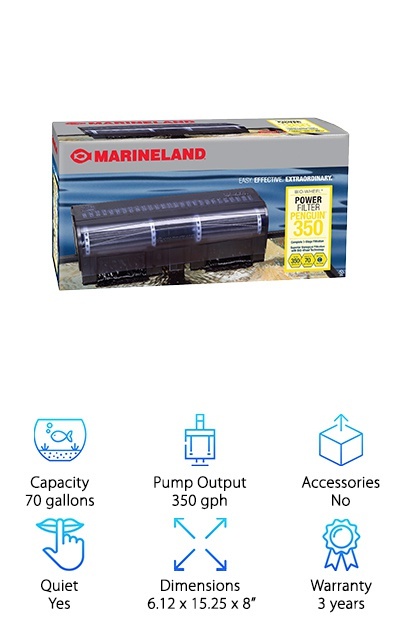 If you have your first large tank and want a filter that’s easy to maintain and use, look no further than the Marineland Magiflow Cannister filter. Included with this best filter for 55 gallon aquarium are biofilter balls and ceramic rings to maintain beneficial bacteria colonies. That’s not all. You also get a polishing filter pad to remove the smallest debris, filter foam pads to get rid of larger dirt and debris, and Black Diamond Carbon to filter out discoloration and other impurities. The filtering media fits into an easy lift out basket so cleaning and replacing. And get this: it holds 3.4 gallons of filtering media. That’s more than enough to keep your tank clean and clear. Plus, this filter comes with a 3-year warranty. For a different kind of filter, take a closer look at the Aquapop Corner Filter. One of the best things about it is the three layered filtering media. The top layer is a white filter pad to provide mechanical filtration, pulling out the larger pieces of dirt and debris. Next is a layer of black bio-sponge and ceramic rings above a layer of gravel. What do these provide? Biological and chemical filtration. You get a range of media with this small but effective filter. Instead of a pump, this filtration system is powered by air bubbles from an exterior pump (not included). Despite its simplicity, this pump is quite effective. It’s good for both fresh and saltwater. Plus, it’s a really good option for a small tank with breeding fish. One of the reasons that this is a best fish tank filter is because of how much comes with it. You have literally everything you need to get started right away. Check it out. First, this filter comes with 3 large media trays that you can use with whatever media you want. To get you started, it comes with a big of ceramic cores, a bag of activated charcoal, a bag of black plastic balls, and a filtration sheet for each tray. You have your chemical, biological, and mechanical filtration covered. You also get all the tubing and connections you need to get this pump up and running right out of the box. Another great thing about this pump? It’s self-priming. No more manual siphoning needed. 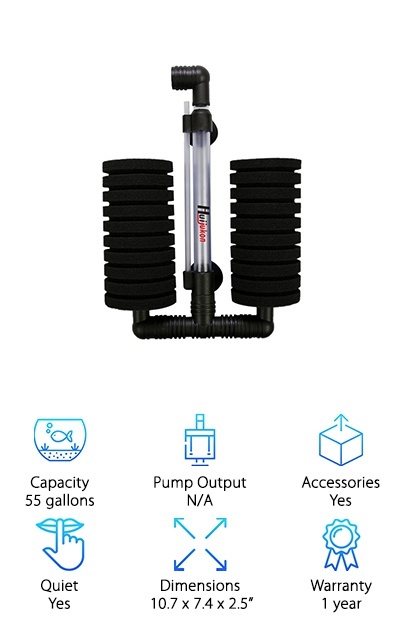 If you’re looking for the best filter for fish tanks that’s a hang-on design, the AquaClear Power Filter is one that stands out. It claims to have the longest water to media contact time in the industry plus it’s easy to use and install. It comes equipped with a generous amount of media: AquaClear foam, activated carbon, BioMax, and Cycle Guard. What does that mean? You have mechanical, chemical, and biological filtration covered. IT allows you to maintain proper levels of beneficial bacteria because you don’t have to throw away any cartridges and wait for new colonies to grow. This is a great choice for fish that like a gentler environment because it lets you control the flow. One more thing: you also get a 2 year warranty. 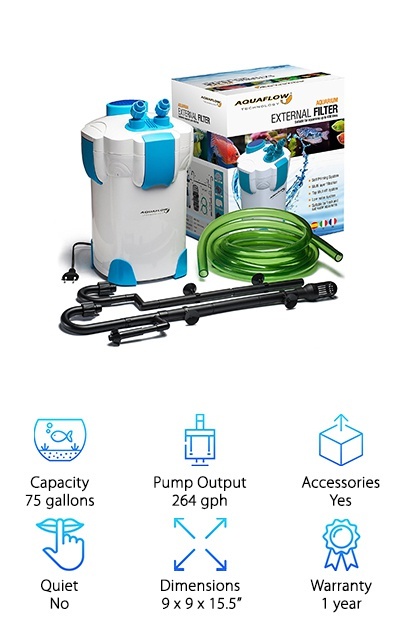 This is a great filter for anyone from beginner to experienced aquarium owner. This hang-on design has an interesting feature with its Bio-Wheel. What’s a Bio-Wheel? It’s a long cylinder that is spun by the water returning to the tank. It’s made of media that encourages the growth of the “good” bacteria that aquariums need to survive. Here’s the best part: it has a lot of surface area, which is ideal because it gives a lot more space to grow strong bacterial colonies. 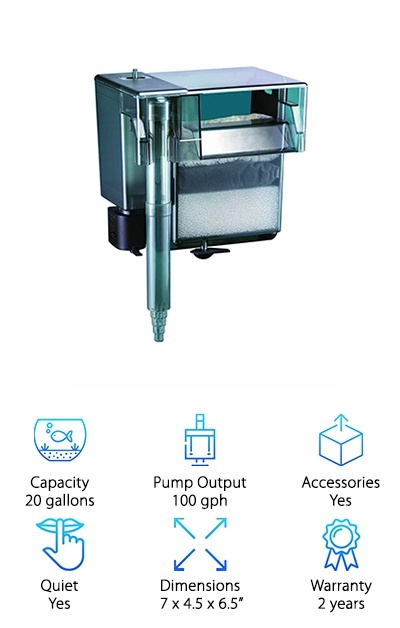 There’s also a cartridge that provides the mechanical and chemical filtration. You can change this without disturbing the biofiltration wheel and interrupting bacterial growth. Here’s the best part. 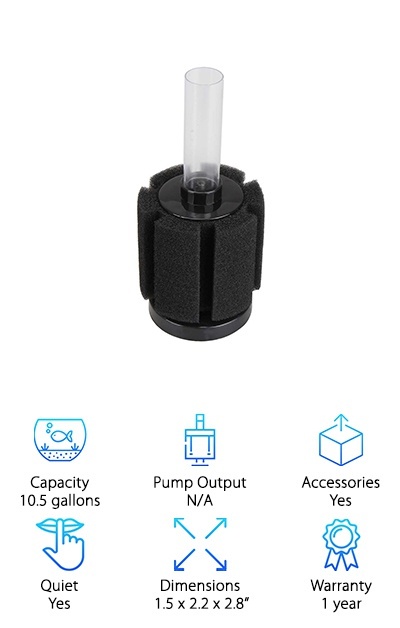 This filter has 100% water to media contact, which means a clear tank for you. 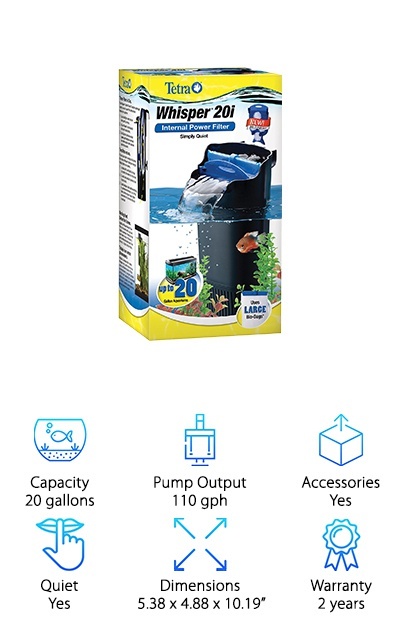 For the best fish tank filter for smaller tanks, have a look at the Whisper In-Tank Filter. This filter is surprisingly versatile. What do we mean by that? Well, for starters, it really is a great in-tank filter. It mounts on the side of the tank and hangs in the water. You can either use a bracket to mount it to the top of the tank or suction cups to mount it lower in the water. Because the motor is under water, these filters are really quiet. It allows you to set up proper 3 stage filtration, too. In fact, each filter comes with a Bio-Bag filter cartridge. Here’s what’s really cool about it: you can use it to create an in-tank waterfall, making it especially suited for turtle tanks. This just might be the best aquarium filter for large tanks. This hang-on style aquarium has the necessary 3 filtrations stages you need to keep your tank crystal clear. In fact, it actually comes with everything you need to get started. You get a poly-fiber cartridge does mechanical filtration and a carbon cartridge to get out any impurities. Of course, there’s biological filtration, too, in the form of an internal sponge that is an ideal place for good bacteria colonies to grow. There’s also an adjustable flow knob so you can turn down the filtration when you need to. Another cool feature is the leveling device that helps keep the filter in the perfect position. And get this. You can use this filter with both fresh and salt water, too. This is another simple filter that requires an air pump for use. The bubbles created by the air pump are what drive the water through the filter. 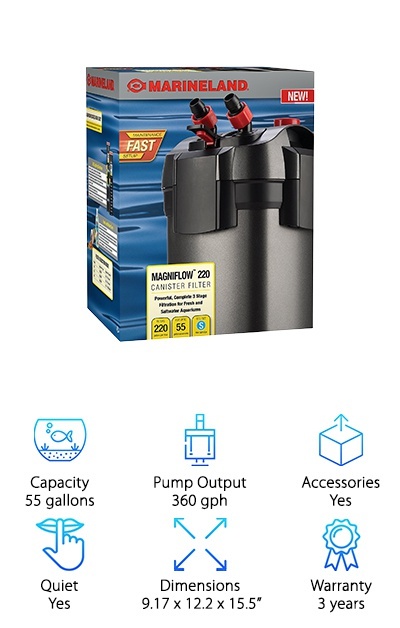 It’s ideal for small 5-gallon tanks. Why? Because it doesn’t take up a lot of room and is somewhat inconspicuous. It’s pretty easy to hide it in the back of your tank behind any plants you might have. For larger tanks, it makes a great second filter if you need it. All the filtration media you need is included but you will need to get an air pump for it to function. From top to bottom, there’s a mechanical filtration layer, activated charcoal to get out any odors or impurities, and gravel and biodomes in the bottom to encourage good bacteria to colonize. The Huijukin Double Sponge Filter is our pick for best filter for a 55 gallon aquarium. 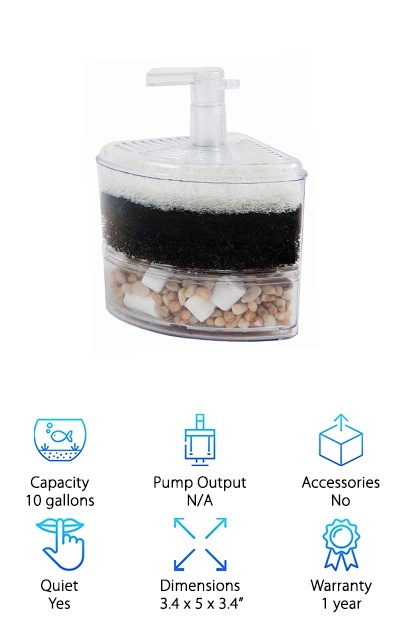 It has a really unique design that consists of 2 sponge filters. These filters provide both mechanical and biological filtration. Plus, they’re really easy to clean. Just squeeze them out in the tank water. All you need to do is hook it up to an air pump and it’s ready to go. It’s also very easy to position. You can change the direction of the air-water outlet so you have control over the direction and height of the water flow. The arms that hold the sponges are also adjustable so you can move them away from the tank walls if needed. One more thing. It’s made of food-grade material. It’s completely safe and environmentally friendly. 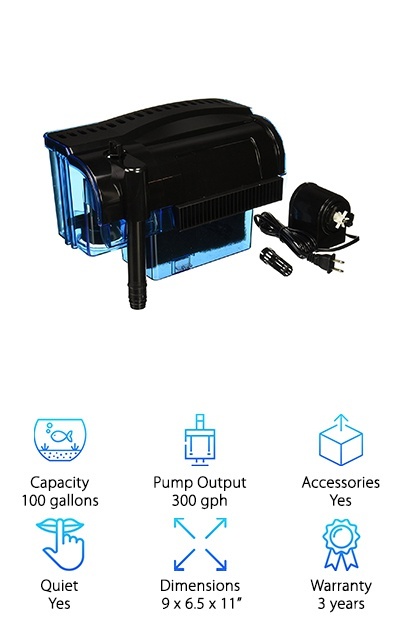 If you have an air pump, this is one of the best filter for fish tanks around. It comes with a cotton sponge for mechanical filtration that also allows good bacteria colonies to grow. The flow from this filter it pretty slow, making it a good choice for fish that are into that sort of thing. Betta fish, for example, do not like a tank that has a lot of movement or noise so this is a great choice for them. It’s also a good choice for a breeding tank for the same reasons. Cleaning is easy, just rinse it in tank water when change the water. This will keep the bacteria colonies intact. Another great thing about these? They’re easy to hide in the landscaping of your tank.